If you don’t agree on this right away, then just imagine yourself visiting a physical shop, and seeing an interesting product on its shelf. And then, tell me what would your very next action be? Checking out how much it costs, for sure! 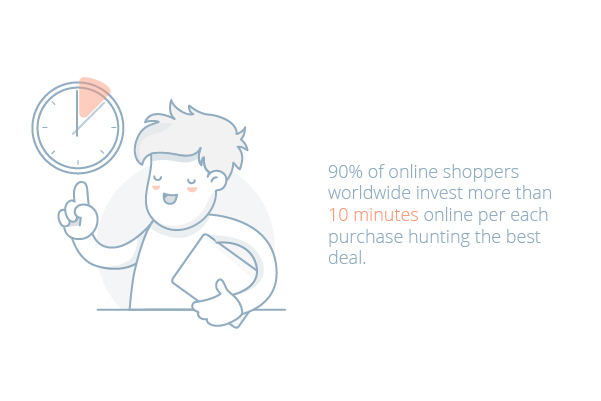 Well, you’re not alone, and when it’s about online shopping, you’re not alone at all. In this blog post, I’ll be sharing how e-commerce companies of all sizes from all around the world can handle their pricing strategies with required attention paid into this particular operation. Pricing should never be considered just as a role of a department or a person in the e-commerce company, but instead should be considered holistically as a team sport where all members of companies add value and insights into this operation. Pricing is not just a decision to be made for the sake of its necessity. 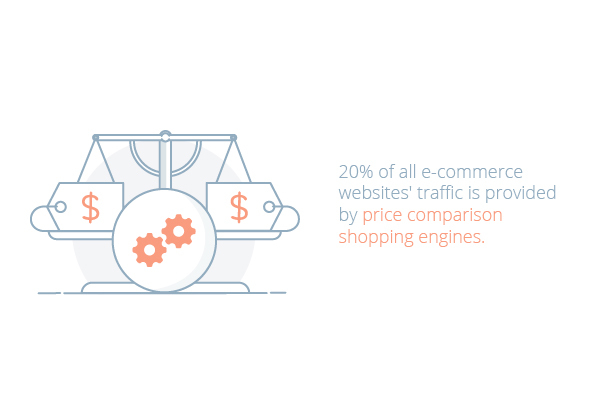 By utilizing the right mix of several pricing strategies and outsmarting competitors, e-commerce companies will see that smart pricing is actually a conversion rate booster and a solid marketing weapon. Well, this strategy is widely known as cost-based pricing. It is by far the simplest pricing strategy to apply for e-commerce companies of all sizes. However, even though it may seem or sound like the ground zero for any business on earth, it’s shocking to see that there are tons of e-commerce companies that fail to manage their short-term costs or project their long-term costs in order to have this strategy set up in their businesses. The point most of these companies miss is how to define the cost. A business, is a profitable one, in case its revenues exceed its total costs, and the word total is the key here. Oftentimes, e-commerce companies solely focus on the unit purchase price they get from their suppliers as the cost of a product. This is an extremely risky way of comprehending costs in e-commerce and needs an immediate fix by taking all other operational e-commerce costs into account as well. There are many cost centers within an e-commerce company like salaries of the staff, customer acquisition costs, e-commerce platform costs, server costs etc. All these costs should be understood extremely well before making any pricing decision and then over-headed into what makes the real unit cost of a product. With such calculation of cost in hand, the only other piece of the pricing puzzle, remains to be the target profit margin. Throughout this decision-making process, companies should really know well their e-commerce vertical and the competitiveness of it. Profit-margins may vary from vertical to vertical and making sense of the overall market conditions in that market vertical and customer expectations will help companies to make better decisions for their target profit margins. As long as the two values for each product, i.e. the unit cost and target profit margin have been decided on, the rest is just summing these two up – not a brainer, indeed. Like any other business strategy, cost-based pricing strategy should also be managed by keeping its potential risks in mind. These potential risks include ending up with products being undervalued or the other way round, products turned to be completely uncompetitive. Therefore, this strategy again should not be considered as a one-time implementation, but instead should be managed along with a continuous performance tracking capability and should be fine-tuned hand in hand with other potential pricing strategies. There are literally hundred thousands of e-commerce companies worldwide, and more than 100.000 e-commerce companies from all around the world enjoy an annual revenue of a $1 million or more – i.e. they do a very significant amount of business. With that said, isolation from the market is a one-way ticket to failure in e-commerce. The most important part of this fact is that, the competition in e-commerce market, thanks to its purely digital nature, is fully accessible to its customers as one-click away options; which really boosts the competitiveness of the market even further. As I emphasized at the beginning, a vast majority of online shoppers are professional deal-hunters, browsing several web-shops to see what they offer for the product they plan to purchase. Additionally, when we take into consideration, the working mechanisms of price comparison engines — ranking different offers from various e-commerce sites, min to max – that are positioned to be an important customer acquisition channel for e-commerce sites, closely monitoring the online market conditions, i.e. the prices, stock availabilities, assortments makes perfect sense — or actually turns out to be a must-have capability. Isolation from the market is a one-way ticket to failure in e-commerce. In such a dynamic landscape like e-commerce market, gaining the required market intelligence and analytics power can be a challenge, but thanks to automated competitor price tracking and analytics tools, companies can monitor the fresh online market data automatically and can act upon it dynamically. — not necessarily only by dropping their prices vs. competition all the time, but also lifting them up when they spot opportunities. It’s not a rare case that an e-commerce company using such automation, notice that for a particular group of products, their overall pricing is well below the competition and in case of a potential increase in prices would not actually effect the min price position, i.e. won’t effect that competitive position attracting the price-sensitive customers. With that decision derived from the analytical tools utilized, e-commerce companies can lift up their sales revenues and profit margins at the same time. The crème de la crème strategy built on top of the market-oriented pricing strategy that I’ve been mentioning above is dynamic pricing. 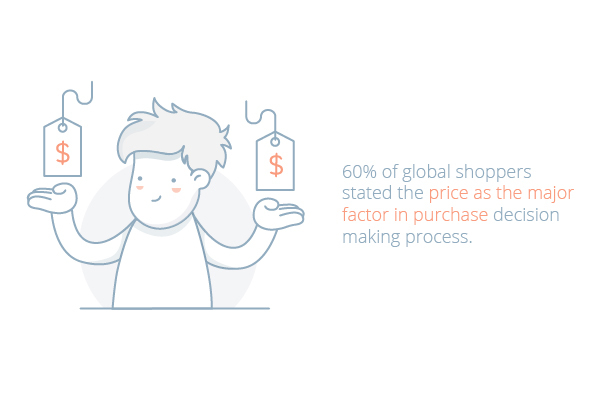 With dynamic pricing strategies, e-commerce companies can automate their pricing decision making processes by associating each price-point with certain rules they define. Frequently updated competitor pricing data is the most sought after trigger when e-commerce companies define rules as part of this strategy. It’s worth noting down that costs should once again come into play here, i.e. dynamic pricing decisions should never neglect unit product costs, to avoid very competitive yet unprofitable price-points for e-commerce companies. Customer-centricity is way beyond just a dull buzzword when it comes to e-commerce pricing. It’s a proven economical approach. Customer-centric pricing, unlike the two previous pricing strategies I mentioned above, is actually less about the numbers, or economics, but more about perceptions, or let’s say, psychology. As part of customer-centric pricing, both of these questions should be answered with customers kept at the very core of the thinking process. You can learn about different customer segments with the Convead application in the Ecwid App Market. According to the answers given to these questions, e-commerce companies can really see what their profit-margin opportunities are, can set the tone of their pricing communication and can make many other similar pricing-related decisions. Thinking deeper on the customer persona of an e-commerce company would also show whether the company is serving mainly deal hunters, or a group of less price-sensitive shoppers. The persona here is born in parallel with the type of the product that the e-commerce company sells. In essence, the main distinction to be made here is to understand whether that product is purchased mainly with the idea of the value in mind of the buyer, vs. of the hard-coded price. For example, more value-based items may give e-commerce companies the chance to offer items with strong profit-margins, whereas, price-based items oftentimes require slim profit-margins for the sake of competitiveness. To conclude, pricing decision-making requires in depth thinking with several different aspects of the e-commerce company’s dynamics, market conditions and customers. The above-mentioned strategies are all derivations of that thinking. Pricing deserves a particular attention and interest along with the right technologies regardless of the size of the e-commerce company or its country or vertical and should be managed all together by the whole of the company. Only then, it goes beyond just being a dull operation and turns into a marketing weapon with extremely solid ROI.